With over 25 years experience In direct marketing, A.M. Mailing offers a professional approach to both new and experienced direct mail users. Whether a large multinational or a small local business A.M. Mailing can offer a service tailored to Individual requirements. With a wealth of experience, A.M. Mailing provides all the key requirements needed to successfully market a wide range of products and services. 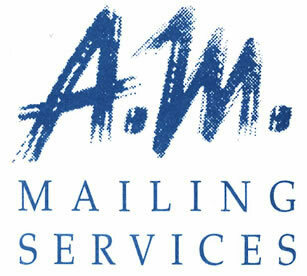 A.M. Mailing comprises of a unique mix of, keying, printing, fulfilment services and response handling, plus CD Business Cards - CD. WEBRON & DVD, Internet Development & Video all under one umbrella. Successful mailings are produced efficiently, often with advantageous cost savings, and importantly, deadlines are met without delay and not resulting in disappointment which is often experienced when a number of different suppliers are involved. Our experienced personnel deal with all fulfilment, including Mailsort. No matter how large, small, complex or straightforward, A.M. Mailing can handle it. Our Standard turnaround is 24/48 hours.